Expert of custom stickers for jet ski since 2005, Kutvek Kit Graphik develops innovative methods of manufacturing creative and resistant decals. The patented material that we use as well as the strict quality control at each stage let us supply our clients with a remarkable result through the years. To answer your special wishes and personnalize your waverunner we offer you the possibility of custom graphics kit. Please forward us some visuals that inspire you and we will implement your ideas into a unique and irresistible design. Your jet ski stickers will showcase each part of your personal water craft: hall, side panels, front cowl, back cover and central part. 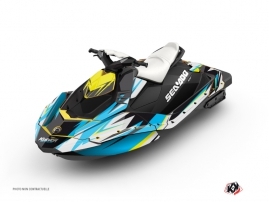 Today our graphic creations are suitable for the majority of jet ski models: Yamaha Superjet, Yamaha VXR-VXS, Yamaha F2R-F2X, Kawasaki SXR800, Kawasaki Ultra, Kawasaki Jet X2, Seadoo Spark, Seadoo RXT, Seadoo GTX. Nevertheless, if you do not find your vehicle at our website, Kutvek offers you to take special templates and to produce custom decals fitting perfectly your measurements. 1. Laying is very simple and fun! You can easily avoid formation of air bubbles by using heat. 2. Colour fidelity is exceptional and colours remain unchanged through years. 3. Our sea doo stickers reveal great resistance to regular water contact (including salted water). If you are searching for Kawasaki stickers for your jet-ski, let yourself surprise by the original look of Kutvek graphics kit. Our attractive stickers will enhance any Yamaha jet ski and any Sea doo as well. You can navigate between ready-made designs, complete customization and an option to simply add your name, number and logo - you have so much choice to distinguish yourself in the ocean of banalities!